Offered during the summer, this program is designed for students interested in taking electives in English while immersing themselves in Czech culture. Popular courses focus on Prague art and architecture, central European history, and European politics. No matter which classes you choose, the intimate class size, interactive teaching methods, and international faculty provide the perfect atmosphere for you to study and discover the Czech Republic. A major economic and cultural center of the Czech Republic, Prague is a modern city that still retains the allure of a former age. The Velvet Revolution of November 1989 saw the overthrow of the Communist regime. On January 1, 1993, the Czechoslovak state was peacefully divided and the independent Czech and Slovak Republics were founded. The formerly centralized state system has since been transformed into a parliamentary democracy and market economy, with the Czech Republic joining the European Union on May 1, 2004. Your walk to school may include a trip through a UNESCO World Heritage site or past culturally and historically rich architecture. 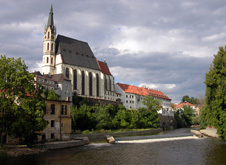 Located in the Baroque Malá Strana quarter, Anglo-American University (AAU) offers a unique opportunity to immerse yourself in both a Czech and international higher education setting. Participate in AAU activities, sports, and clubs, or explore the city with new friends. Don't forget to check out the Strahov Monastery, Petrin, or the cubist House of the Black Madonna.